New iOS UI Widget library with Justinmind! With our latest release, we brought you a brand new iOS widget UI library! This library comes pre-loaded in our updated Pro edition of Justinmind. Let’s have a closer look at the perks! Like all of our widget libraries, our newest iOS widgets are entirely customizable to allow precision scaling and maximum quality, at any size. However, there is something a little bit more special, and different from our previous iOS libraries, this time round! With this iOS widget library, we’ve tapped into the atomic design elements that we incorporated into our Android widgets. Our earlier iOS libraries were built using images and were not built to customize easily. In contrast, our 200+ new iOS widgets, icons and screens have been created using basic JIM iOS components, grouped together, so that you can customize the UI library more easily! 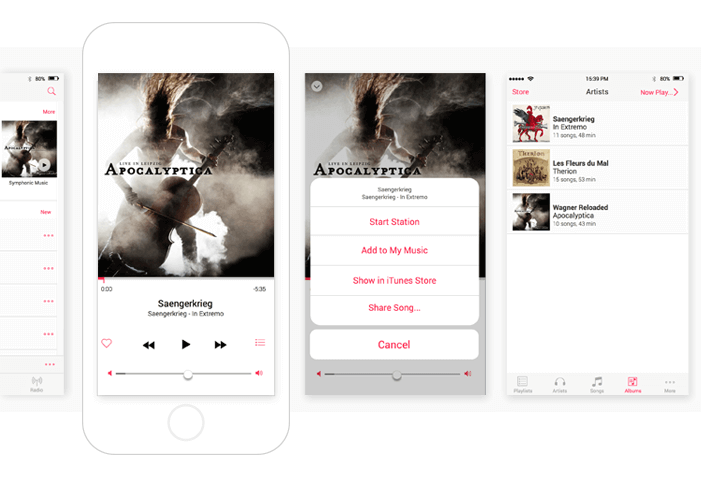 Kick-start your iOS app prototyping with our ready-made screens. These pre-defined components have been built using tables and cells (instead of dynamic panels) so that you can add/delete/modify any aspect of the design. This should also help with navigation of the screens and improve usability! Download Justinmind today and discover our new iOS UI elements now! Easy access to your most used elements! We’ve improved the structure and positioning of UI components in this library too! The 6 most-used components feature in the first window of the UI library, with a selection of screen examples, content blocks and dialogs that follow. Below this, you’ll find your basic content, including forms and controls, bars, menus, tabs and buttons. This will hopefully make for better visibility so that you don’t waste any time in prototyping! Check out the brand-new iOS widget library here and get started on your app prototypes now! Give it a try, we won’t disappoint! Not working with iOS? Check out our complete set of widget UI libraries available for you to download here! Including Android, Google Glass, Apple Watch, Windows, Facebook…the list goes on!